"... Been in the lifting game for about 15 years and pretty much seen the rise of all these supplements. The pre-workouts are my favorites, and along with basic protein, one of the few that are worthwhile. I have used Superpump now since the start and am currently using the new version, MAX. I find the flavors to be the same and the results to be much improved. The main thing I note is that the old formula really upset my stomach, hence the nickname for the old formula of SuperDUMP. Not the case with MAX, I am at the max 3 scoop dose and zero side-effects. Good pumps and stronger energy throughout my workouts." "... really disapointed, nothing compared to the old one. Lots of people are asking where they can find the old one. Hope Gaspari will do a new/better one!" "... Using superpump max now with the new sizeon maximum as well and really pumped (literally) with the results. Great taste and no crazy hives like bsn gave me. Getting really good energy and focus and longer endurance. Best part is of course the pumps and vascularity I get which is good motivation and really helps me connect with the muscles because I can tense, flex it." "... I am interested in trying this product out, can someone tell me the best way to use it and with what other products? My goals are to increase my muscle size and stay lean." One of the best pre-workout supplements on the market. The best way to use it is to take 1, 2 or 3 scoops about 30 minutes before you train. It is a strong stimulant and will produce awesome pumps and improve your workout endurance. The other product that you can try with it is a intra-workout supplements with BCAA's such as XTEND or SIZEON. This is a good combination to feed your muscles and help you grow and recovery. Be sure to also use a good protein source after your workouts such as 100% Whey or such. "... I have been supplementing with superpumpmax now for about 3 weeks, this is my first experience with any preworkout or gaspari product so I am a fresh fish. Anyway, I am hooked to say the least! From the first 1 scoop serving I took I had the best workout of my life due to the energy levels, amazing pumps and longer endurance to keep up with my partners finally. Over the past few weeks I am fuller and my muscles look harder. Overall strength keeps going up which is great as well. In terms of the flavor, it's also very nice. I will be trying to add in the sizeon max product as I read good things about stacking these two. I will post in the appropriate section with that. Overall, fantastic product, 5/5"
"... Using the samples packs as that I grabbed at the expo.. have enough for about 15 workouts as my friends helped me get a bunch. So yea, used it now for about 4 workouts and really noticed it worked good to give me a better pump and i was wired with energy.. this is also my first time with any kind of pump supplement so i am a newbie. I really like superpump max though, will be ordering it when it comes out for real." "... Using the samples of superpump maxx I got from the expo and it's working pretty well. First time user of gaspari products or even pre-workout boosters, but had a great informative talk with the owner mr gaspari at the booth and really made sense, besides the samples were free.. i have a few weeks worth. will be ordering some for sure and also adding the sizeon product to drink during to see what i can get out of it. pretty excited as its really improved my workouts and made it fun with the good pumps and energy increases." "... Does anyone have any idea on an actual week for this release? Or when it will be in stores?? I realize it is already revealed and out there at the Olympia but for those of us that could not get there. Can someone throw us a bone? Peace." I am pretty sure that it will be out very soon through the store at this site soon and with a Watermelon exclusive flavor.. hopefully soon as I am anxious to give it a go as well. "... I totally agree with the Gaspari SuperPump MAX ads claiming that the CONCENTRATE IS BS, it's completely true. Nothing but a quick stimulant product that sure gives you energy to train hard but does NOTHING for recovery, muscle growth or strength in the long run. Having ads with some dude in chains training in hell or something is really lame. Stay away from the hype concentrate hype.. just another word to confuse the first timers out there that believe all the non-sense ads out there." "... I for sure plan on using the new MAX, I am currently using the low carb sizeon and getting really nice results. One serving during the workout and one immediately following. Anyways, from what I read the MAX should be out around the time of the Olympia and will come in two flavors, fruit punch and blue raspberry. "... Hey guys.. great find! I was wondering what will it be compared to the current 250 version? So Superpump MAX vs 250? I am assuming MAX will be better otherwise they wouldn't be releasing the new version!" MAX in my experience is far superior to the original formula. Taste is about the same but the pumps are better and longer and my body doesn't adapt to it as quickly as the original formula did. "... Hey guys, Matty - I'll also be at this years Mr Olympia contest.. first time! So there will be free samples of this new superpump max out there? That is awesome news.. I'll be sure to visit the booths then.. what is the best day to go? Really a big fan of gaspari supplements since day one.. always give good results." "... I will be at the Olympia expo this month so I'll be grabbing all the free samples I can! You can bet I'll post my opinion on it.. stay tuned folks!" "... So sweet.. good job fitflex! I am really looking forward to trying this bad boy out.. when exactly will it be ready to ship? I am using the high carb sizeon max and lovin it!" Gaspari - SuperPUMP MAX 2 - All NEW! From the teasing I TRAIN WITH MAX Advertisements.. finally revealed SuperPump MAX! 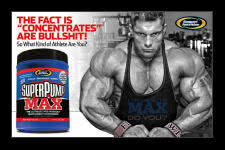 So here it is.. the release from Gaspari Nutrition the all new and exciting SuperPump MAX! With so many pre-workout supplements on the market today, it can be hard to pick the right one - to get the most bang for your buck so to speak. If you're interested in getting stronger, do you want to see results when you look in the mirror? Do you want a more leaner and vascular physique? Well SuperPump MAX is what you've been looking for to get you there. Using the latest ingredients ever in a pre-workout powerhouse, with Gaspari's committment to making the absolute best products, rises SuperPump MAX! Forget about the rest of the pre-workout products that depend on stimulants that lead to crashes and in essence, no real results. Gaspari actually publishes all of their studies to back up their claims, this is rare in the market of supplements! Take the athlete in you to the next ultimate level with SuperPump MAX today! 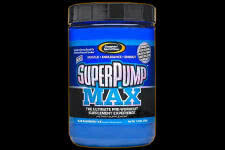 Gaspari Nutrition brings us another update to their MAX lineup with the all new SuperPUMP MAX! We've seen the ads in the muscle mags for months and we feel we've discovered the supplement behind the mystery.. SuperPUMP MAX! The success of the original SuperPump 250 formula that's been around for years, there is no doubt that we're in for something special! There is very little information regarding the ingredients or actual updates involved in the SuperPUMP MAX product - but rest assured we'll have all the information and reviews as soon as it's released! Gaspari has been in the forefront of the supplement industry, and there is no question they will have many more exciting and ground breaking additions to their name in the game plan! Muscle - Endurance - Energy .. Intoducing SuperPump MAX! I Train with MAX.. the all NEW SuperPump MAX! .. Do you?